Everyone felt Tony Williams’ lead was the most attractive. He was followed by Sony Turner, then Monroe Powell, but some of the original members did not like the new lead vocals, so they left the group and started their own in search of a lead singer like Tony Williams. Paul Robi continued The Platters for approximately 20 years with Elmer Hopper as the lead. Paul Robi died in 1989. It is 30 years since Reed, Robi and Ram started a three-cornered battle over the Platters name. During this time, the verdict went to Ram, then back to Robi, and in the meanwhile, both of them have died. 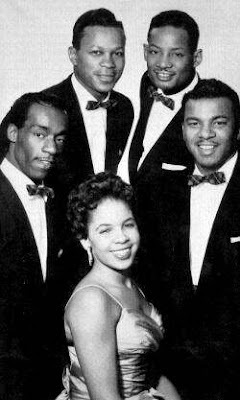 Nearly 20 groups scattered around the world are calling themselves “The Platters”. This dispute is yet to see the end. The Platters’ name is all that attractive. There’s a similar tale about the legitimacy of the trademark “Noren” curtain of a famous “Soba” (Japanese noodle) restaurant in Azabu-Jyuban Nagasaka. Tony Williams himself said that the only singer who is good enough to sing his hit songs is Elmer Hopper. The very same Elmer Hopper one day sent Shakushigakudo Master an email asking about something he wanted to know. He asked about news on some Japanese musicians. He didn’t know that Hidehiko Matsumoto had died. He had toured Japan often during the ‘70s and ‘80s. He now tours as the Mills Brothers with son John II of the youngest of the original Mills brothers, Donald. In October 2005, John Mills II and Elmer Hopper toured Japan as the Mills Brothers. I hadn’t thought that they would be able to make a tour here, so we all were very happy to be able to meet in person. What a strange coincidence. I had been corresponding with John II since 2003 and with Elmer since 2004 via the internet. This is the first time to visit Elmer's blog. He wrote me an e-mail tonight, and I have konwn the URL. Thanks Kuni and Bob Davis for stopping in on my blog page. I treasure both your opinions about music and life in general.